This CellML model runs in both COR and OpenCell to replicate the results in the original published paper. The units have been checked and they are consistent. Please note that this CellML model is based on the equations from the main body of the paper, not the appendix, and so it does not reproduce the cyclical graphs in the paper. The model does however produce results which match the first cycle of the graphs in the paper. Until events can be described in CellML we are unable to capture the switches in this model. ABSTRACT: A central event in the eukaryotic cell cycle is the decision to commence DNA replication (S phase). Strict controls normally operate to prevent repeated rounds of DNA replication without intervening mitoses ("endoreplication") or initiation of mitosis before DNA is fully replicated ("mitotic catastrophe"). Some of the genetic interactions involved in these controls have recently been identified in yeast. From this evidence we propose a molecular mechanism of "Start" control in Schizosaccharomyces pombe. Using established principles of biochemical kinetics, we compare the properties of this model in detail with the observed behavior of various mutant strains of fission yeast: wee1(-) (size control at Start), cdc13Delta and rum1(OP) (endoreplication), and wee1(-) rum1Delta (rapid division cycles of diminishing cell size). We discuss essential features of the mechanism that are responsible for characteristic properties of Start control in fission yeast, to expose our proposal to crucial experimental tests. 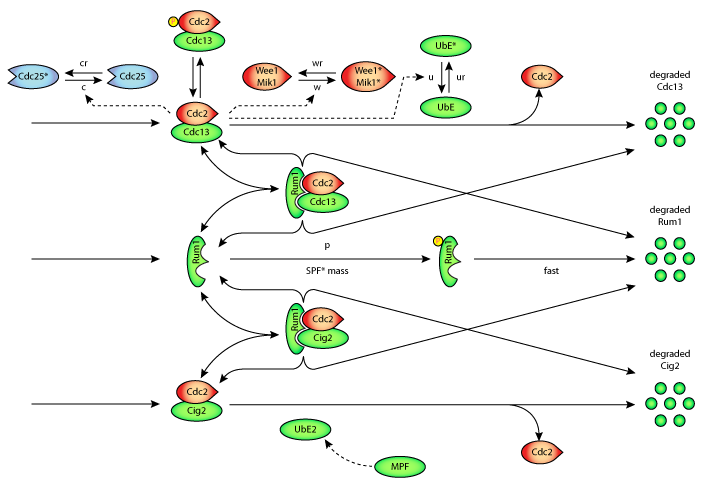 A schematic diagram of the reaction mechanism which describes the G1/S and G2/M controls in fission yeast. (i) When SPF crosses 0.1 from below, S phase is initiated (Start). (ii) When UbE crosses 0.1 from above, the cell divides functionally (mass->mass/2), although visible cytokinesis may be delayed. (iii) 60 min after Start, kp is divided by 2, and at cell division kp is multiplied by 2. (taken from Table 1 of the cited reference). Derived from workspace Novak, Tyson, 1997 at changeset 3614b6d39b91.